Installation Hubs: Anacostia Arts Center, 1231 Good Hope Rd, SE, Washington DC & We Act Radio, 1918 Martin Luther King, Jr. Ave, SE, Washington DC. Day 1: Thursday, April 4 — Launch, Viewing hours 3-8 pm. From 5-6 pm, Dedication ceremony/opening at We Act Radio. Reception and viewing continues until 8 pm. Second day of WRAPture installation. Viewing hours 1-7 pm. From 1-3 pm, Slideshow in Anacostia Arts Center’s Black Box Theatre, featuring the sari workshops in Washington DC and Bangladesh. From 3-5 pm, Poetry Showcase by WRAPture Participants, in Anacostia Arts Center’s Black Box theatre. Activities and engagement for all ages in Anacostia Arts Center main space. Final Day of WRAPture installation. Viewing hours 3- 8 pm. From 6-8 pm, Closing Reception at We Act Radio. After the performance, join us at Superfine! for a panel discussion on art and climate change at 5 pm, followed by a screening of short performance art films by Monica Jahan Bose at 6 pm. "When It Comes to Sea Level Rise, Can Art Keep Us Afloat?" blog post by Superfine! 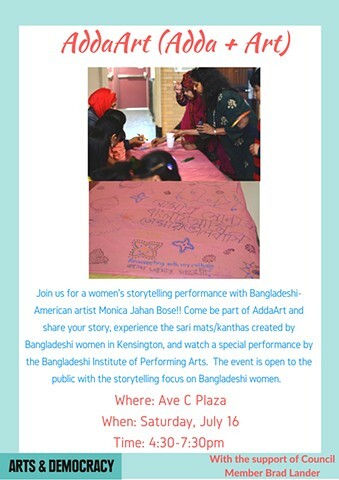 An exhibition, workshops, and performance by Monica Jahan Bose. Opening reception and workshop: July 5, 7 - 9 pm. 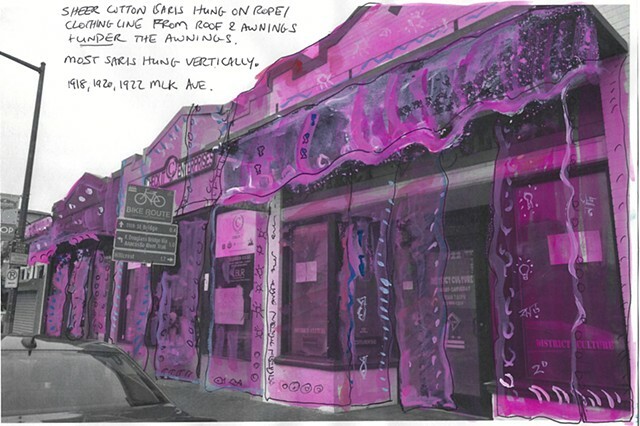 Closing reception and performance Home-Spiti-Bari: July 18, 7-9 pm. Exhibition dates: July 5-18, 2019. Hours 10 am - 6 pm weekdays, 10 am to 4 pm Saturdays. FOOTPRINT-APOTIPOMA is a collective response to climate change and migration. Climate change and conflict are destroying people's homes and homelands, leading to migration of people across borders. 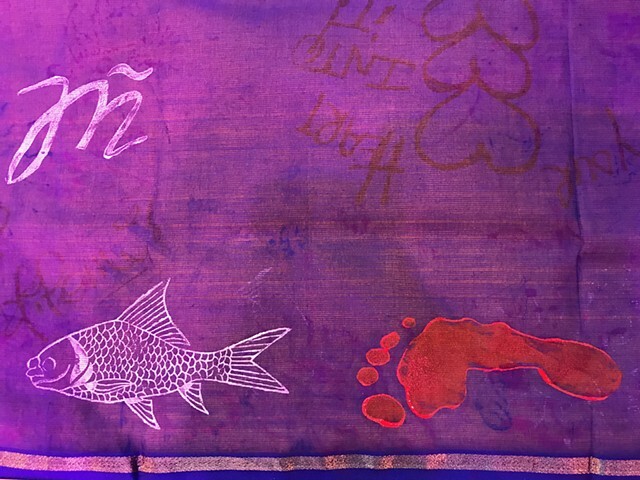 Using saris from Bangladesh covered in writing and images by Bangladeshis, Americans, and Europeans, Bose creates an interior space or dwelling within the gallery, speaking to the idea of shelter, safety, and working together to address a global problem. Her works on paper address the disruption of nature by climate change, using a combination of printmaking, painting, and words in many languages. Bose will organize multiple workshops and a performance and will collaborate with refugee women in Athens. Please join the interactive performance on July 18. The exhibition is organized by the Mayor's office of Athens and is supported in part by Sister Cities Grant from the DC Commission on the Arts and Humanities, which is supported by the National Endowment on the Arts. It will be held as part of Athens' designation at World Book Capital 2018. Weather the Storm centers on a series of performances and climate art actions that Monica Jahan Bose has led since November 2016, presenting new paintings, video, prints and saris. 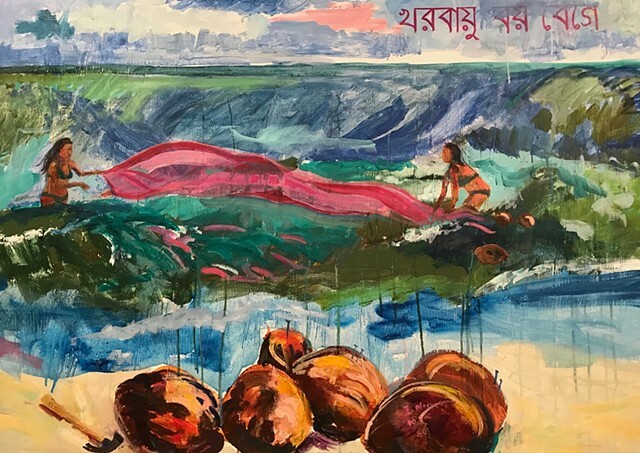 The title of the show derives from a Bengali song that the artist has been singing in her performances, lines from which appear in her paintings. She has taken Tagore’s "Kharobayu Boye Bege (Storm Winds Are Blowing)" and replaced “O boatman” with “O Woman” to create a feminist song about working together to row a boat to shore during a storm. Over several years, she has collaborated with homeless women from Calvary Women’s Services in Anacostia as well as women from One Billion Rising, a global platform to end violence against women, and the women of her ancestral village, Katakhali Village, Barobaishdia Island, Bangladesh. Bose’s performances, paintings, videos, works on paper, and saris explore themes of empowerment, environment, mythology, and community. A Bangladeshi-American artist and lawyer who has lived in seven countries, Bose uses Bengali and English text and women’s writing as integral elements in her work, highlighting multilingualism and women’s agency and literacy. Bose has long used the sari — 18 feet of unstitched handwoven fabric — to represent women’s lives, both in her paintings and her ongoing social practice project Storytelling with Saris. She has started using the coconut as a symbol of climate resilience. Each of her recent performances about climate change — in Miami, Washington DC, Honolulu, Paris, and Katakhali Village, Bangladesh — involved months of planning to create a woman-centered community, which comes together to collect dozens of coconuts to build a raft, sew saris together to make a massive sari, write carbon reduction pledges on saris, or grow and plant a coconut tree. Image: Storm Winds Are Blowing, 2018, 35 x 51 in. 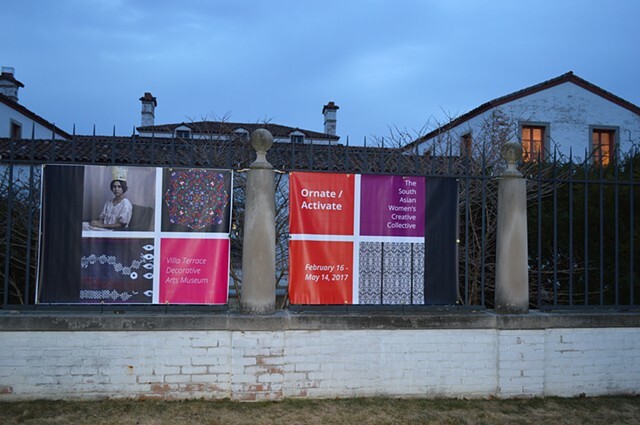 The exhibition is accompanied by a new publication, Rising Up to Climate Change: Storytelling with Saris, and is funded in part by a grant from the DC Commission on the Arts and Humanities, which is supported in part by the National Endowment for the Arts. October 16, 2017 noon - 9 pm. RECLAIM at Smithsonian's "Ae Kai"
I will be presenting RECLAIM, an installation and interactive language and climate lab in collaboration with Hawai'ian artist Hina Kneubuhl. I am also collaborating with Hawai'ian artist Sloane Leong on a zine about the language movements in Hawai'i and Bangladesh. Special performance on Saturday, July 8, 2017 at 4:00 pm, starting at the Foodland site and moving to Ala Moana beach park. Talk by Monica Jahan Bose on February 16, 2017. Ornate/Activate examines the use of decorative arts and motifs, architectural elements, scripts, traditional materials, and other forms of pattern-making by artists of South Asian origin to create meaningful and critical content. The exhibition, organized by the South Asian Women’s Creative Collective (SAWCC) and curated by Alexander Campos, addresses themes such as inequality stemming from the global economy, loss of language and culture, gender violence, discrimination, segregation, and issues of equality and identity. The artists in Ornate/Activate recognize a need to reclaim tactile and decorative methods of making as a way to address social, political, and economic issues and also to confront the ever-growing presence of technology in everyday life. Nida Abidi, Fariba Alam, Kamal Badhey, Shelly Bahl, Marcy Chevali, Priyanka Dasgupta, Roya Farassat, Asha Ganpat, Parisa Ghaderi, Zainab Hussain, Monica Jahan Bose, Vandana Jain, Umber Majeed, Radhika Mathews, Indrani Nayar-Gall, Nirmal Raja, Sausan Saulat, Suran Song, Udita Upadhyaya. Arts & Democracy presents AddaArt, a workshop, oral history project, and performance initiated by artist/activist Monica Jahan Bose in collaboration with the Bangladeshi immigrant community in Kensington, Brooklyn. The project is bilingual, in Bengali and English. The project team includes project coordinator Hasiba Haq and cultural organizers Caron Atlas and Michelle Proffit. “Adda" is the Bengali word for intense conversation - both intellectual and personal - often carried out in public places and accompanied by tea and snacks. The Oxford English Dictionary defines “adda” as “a place where people gather for conversation.” Adda has usually been the privilege of men, while women and girls are relegated to the domestic sphere in South Asia and its diaspora. Adda and Art come together in AddaArt, to highlight the rich art and stories of the community. 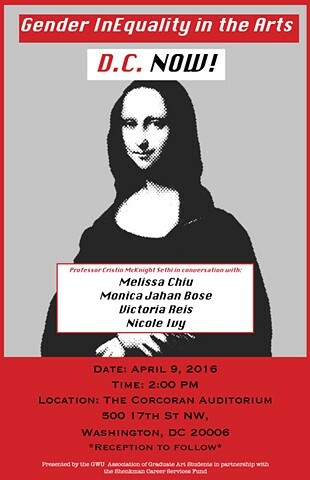 Time: Saturday, April 9, 2016 @ 2 pm. George Washington University's Association of Graduate Art Students is hosting a panel discussion with some of the leading art professionals in DC! The panelists are as follows: Dr. Cristin McKnight Sethi will moderate this panel. She is an art historian and curator of South Asian art with a focus on textiles and folk art. She holds a PhD from University of California, Berkeley. Dr. Melissa Chiu is the director of the Smithsonian's Hirshorn Museum and Sculpture Garden. She oversees a staff of 50 and a collection of nearly 12,000 objects that represent pieces by leading artists from the late 19th century to the present day. She received her PhD from University of Western Sydney. Monica Jahan Bose is an artist whose paintings, works on paper, performances and installations are symbolic narratives addressing gender, women's literacy and sexuality, and climate change. She strategically moves across media and disciplines to address complex issues and engage diverse audiences. Victoria Reis is the Co-Founder, Executive & Artistic Director of Transformer, founded in 2002 in Washington, DC. She began her career in contemporary visual arts at the National Association of Artist's Organization. Dr. Nicole Ivy is the Museum Futurist fellow at the American Alliance of Museums. Her work focuses on museum labor practices, especially as they affect diversity, equity and audience. She received her PhD from Yale University. Cinema Green Film Screening "Climate Change and Bangladesh"
Thirty Million by Daniel Price and Adrien Taylor. Featuring Q&A with Monica Jahan Bose. Performance art festival featuring Monica Jahan Bose, Shazia Shikander, Sumit Baudh, and Qasim Reza. Monica Jahan Bose will create RISING, a performance/installation. Cosmos Gallery is presenting Rokeya Sultana, Monica Jahan Bose, and Preema Nazia Andaleeb. I have an installation of saris, video, photographs and prints. I am also doing a performance called JALOBAYU on December 5 at 4 pm. I have an installation of photos, video and saris in this show and will be doing a performance/installation called "Water" on opening night at 7:30 pm. Curated by Jasmine Wahi and Rebecca Jampol. MUST RSVP specialevents@worldbank.org by May 20. I have two-large paintings in this show, representing the North America region. Date/Time: Friday, April 25, 9:30 pm. Using saris, fire, and water, the performance speaks to climate change and its destruction of lives and heritage. Armstrong), two nights of performances, addressing the role of document, archive, constructions, and remnants in performance itself and long after the fact. time: September 28 at noon and 4 pm, September 29 at noon. 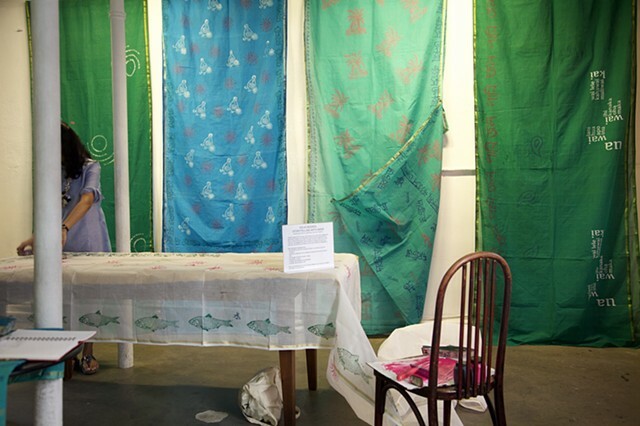 "Layer by Layer: Storytelling with Saris"
"Her Stories: Fifteen years of the South Asian Women's Creative Collective"
Closing reception (5:30 to 7:00 pm). Gallery hours: W-F 11 - 5 pm and Saturday 11-3 pm (or by appointment). December 9, 2012 from 11 am to 6 pm. As part of Art Asia Presents, I will be doing a performance/installation called "Indelible Scent." Performance times: December 4, 5, and 8 @ 6 pm. I was asked to contribute an article for the special edition of "Vibrant Bangladesh" in commemoration of 40 years of Bangladesh's independence. Please come to this gorgeous show, where I have a new mini sculptural installation. I will be giving a talk/presentation about a collaborative printmaking and story project celebrating the achievement of literacy by women in the remote island community of Katakhali, Bangladesh, which is my ancestral village and part of an eco-project run by Samhati, a Maryland charity. I will be doing my first performative installation at this event. (Ground floor in the brick Canal Square Building, next to Parrish Gallery). I have created a site-specific installation for this event using saris, sari blouses, copper, onions, and stones. The self-portrait "Estrogen/Moonlight by the Red River" won first prize in the show. I will have a solo show at Sitar Art Center in 2013. I am on the board of this artist's collective and participating in this event, showcasing work by a number of emerging and established artists. "Speak Your Mind: The Lives and Stories of Muslim and Arab Women"
Address: Galerie Municipale Julio Gonzalez, 21 av Paul Doumer, 94110 Arcueil. Opening reception: Friday, May 28, 2010, 6:30 pm. Exhibition continues until June 19, 2010. Hours: Thursdays and Fridays from 4 to 7 pm; Wednesdays and Saturdays from 2 to 7 pm. Opening reception, April 9, 2010, 6-9 pm. Address: 3-5 passage Gravilliers, 75003 Paris. Art Camp for Inauguration of Dhaka Art Center, January 1-2, 2010. Completed new work, "Happily Ever After."